People in Airports remind me of cows in the tramp shed waiting to be milked. They stand around in straw and manure, they are not to bright, and generally just look dazed chewing their cud. Nothing bother a cows, they will put up with about anything, as they are not aware of their surroundings. The new Suvarnabhumi Bangkok Airport is an Architectural nightmare, why do Architects have so many problems, is the modern man totally incapable of empathy. There are 1000’s of Airports on the planet, the world spends millions and billions of dollars on Airports, I think they should be comfortable. However, the cows in the airport never know they are in a Tramp Shed wallowing in their own excrement. I need to sit around many an hours in the Bangkok, Airport waiting for flights, I am truly amazed they can design and airport this uncomfortable. I keep waiting for the people to start to Moo. 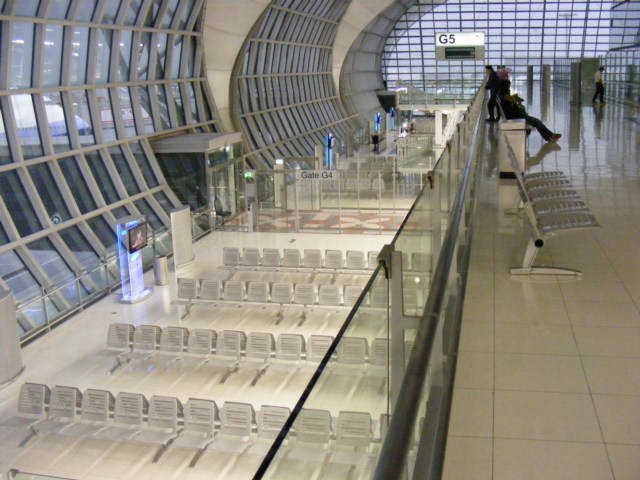 Picture of the departure gates in the Bangkok Airport in Thailand. Ok, I do wish to admit, they did greatly improve on the arrival gates, and the check in counters are nice, however where the people spend the bulk of their time is a mess.